Sugar, butter and almonds combine to make a cake sweet enough to please the bees, hence the name. This is a favorite in pastry shops all over Germany. 1. Preheat the oven to 190 C / 375 F/ Gas Mark 5. Sift the flour and pinch of salt into a large mixing bowl. 2. Cream the butter until light and fluffy and gradually add the sugar, beating until the mixture is light and fluffy. Beat in the eggs one at a time and add the vanilla. 3. Using a large spoon or rubber spatula, add the milk and the flour, alternating between the two. Use enough milk to bring mixture to thick dropping consistency. 4. Grease and flour a spring form pan and spoon in the cake mixture. 5. Combine the topping ingredients and heat long enough to dissolve the sugar. 6. Sprinkle the top of the cake mixture lightly with flour and pour on the topping. 7. Bake in the preheated oven for 25-30 minutes. The topping will caramelize slightly as the cake bakes. 8. Meanwhile, prepare the filling. Combine the sugar, corn flour and egg yolks in a bowl and whisk until light. Pour on the milk gently and gradually whisk into the egg yolk mixture. Strain the mixture into a heavy-based saucepan and cook over very gentle heat until the mixture coats the back of a spoon. Add the vanilla or almond essence and allow it to cool. Place a sheet of damp greaseproof paper cling film directly over the top of the custard as it cools. When the custard is completely cool, lightly whip the cream and fold it in. 9. To assemble the cake, loosen it from the sides of the pan turn the lock of the pan and push the cake out. Use a spatula to lift the cake off the base of the pan and cut the cake in half, horizontally through the middle. 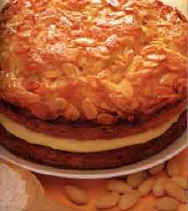 Fill the cake and sandwich the layers together with the almond topping uppermost. Chill thorough before serving. Cut the cake in wedges to serve.